I have longed love purchasing handmade products from other artisans like myself. Plant Makeup (formally Good 4 You Herbals on Etsy) is one such company that is always a joy to buy from. 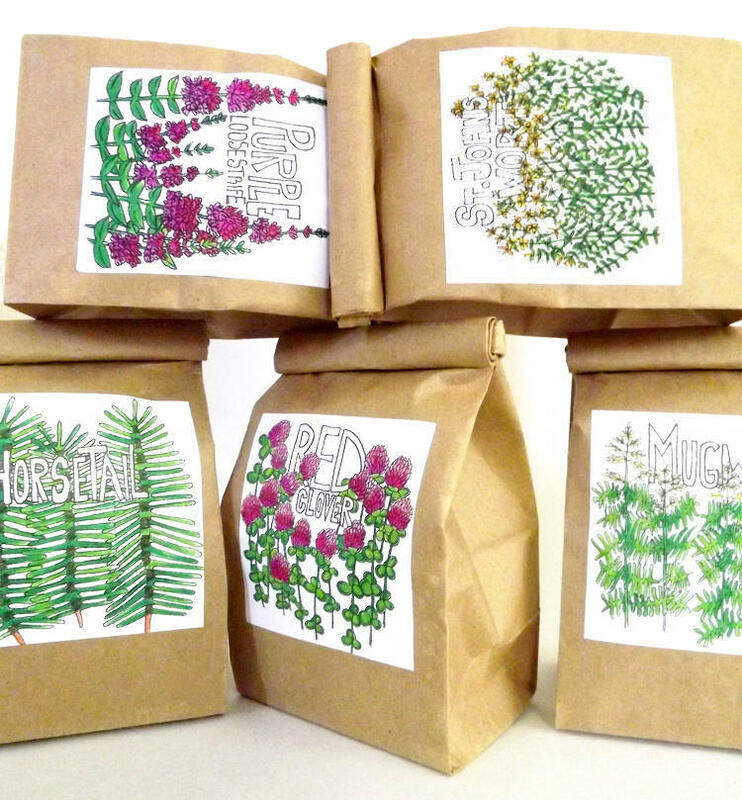 Not only does Jes use herbs and plants she’s wild harvested from her home state of Massachusetts, but she’s also lent her inspiration through her own hand drawn labels and use of organic ingredients. She even bikes her orders to her local post office. While I won’t be biking orders any time soon, I was able to get Jes to contribute a DIY for you all. I hope you enjoy her how to on making your own custom herbal tea blends and home remedies below. BASIC TEA MAKING . 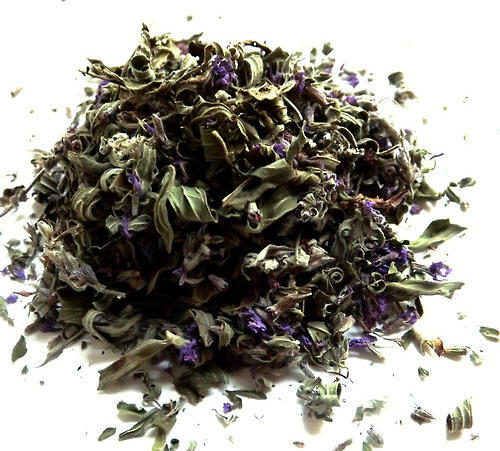 secrets to my custom herbal tea blends . It’s easy to make tea, even simply from anything you can find in your kitchen spice cabinet. Here are some herbs and how they can help you during the winter or when you or a friend are in need. Peppermint– great for cooling the body, for irritated lungs or to ease colds, awesome stomach calmer. Yerba Mate– caffeinated, “the green tea of South America”, great for the mind, circulation, contains medicinal properties. Orange Peels or Lemon Peels– heating, rich in vitamin C.
Hibiscus Flowers– heating, rich in vitamin C, turns the tea purple, helps “dry” the lungs of too much mucus. Marshmallow root– cooling, “wet”, adds a coat of mucilage if you have a dry cold, cough, throat. Gingko Leaves– heating, “the great circulator”, helps to move blood flow in the body. The following herbs I have used for helping colds and sore throats that can easily grow in a summer garden. It’s amazing medicine containing antibacterials, antimicrobials, etc: thyme, lemon balm, mints, hyssop, feverfew (a great cold fighter, use very little amounts), dandelion leaves (great cleanser, lots of vitamins and minerals), sage and catnip. Any spice used can greatly help a cold, move menstruation, and help digestion of course! I used a blend of rosemary leaves, lemon balm, cayenne to help someone with cramps and it worked! Cayenne– heating, great expectorant if you have a stuffy nose, also an amazing antibacterial so it can purify the body when you have a cold or sore throat. Any of these spices if just a touch added can help move a cold out of the body: cinnamon, cloves, black pepper, cardamom, fennel, etc. 3. ADD ROOTS: (½ to 1 part) roots are great for strength, help you cleanse, and or adjust to stress. Eleuthero Root– (Siberian ginseng) great strength builder, helps adjust you to winter conditions and stress, was used in Japan after atomic bombings to help people recover. Echinacea Root– great to help boost immunity right before you think you’re getting a cold. Dandelion Root– a great overall cleanse for the kidneys and liver. I think for the entire body! Stevia Leaf– natural sweetener, 400 times sweeter than sugar, use only a half centimeter of leaf per cup, experiment and have fun, stevia is known to balance blood sugar levels and help diabetes. Licorice Root– yummy sweetener, adds mucilage if you have dry conditions. Don’t use too much of this one either. BREWING: Boil fresh water, remove water from heat, pour into cup of herbs (I use a heaping teaspoon per serving), steep with cup covered for about 10 minutes, about 4 with the green tea family. Sore Throats or Colds- Chopped fresh ginger root simmered in a pot of water for 15 minutes. Remove from heat. Add a teaspoon of honey, half a lemon, and a pinch of cayenne per serving. You can also just use regular black or green tea instead of ginger. If you’re as excited about Jes’ shop as I am then you’ll definitely want to follow her on facebook, twitter, instagram and tumblr! i love all the natural scents! chamomile,lavender, sage are all my favorites! I love that everything you have is handmade. 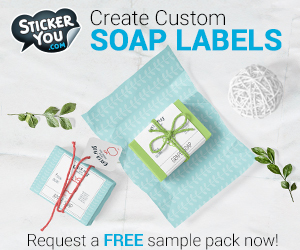 I also love your labels, they’re always so fun and colorful! I love natural things, the smell and the packaging of your things. I love that I don’t have to worry about artificial scents. Thank you for this post! I love collecting herbs, and it’s nice to have a recipe for tea. 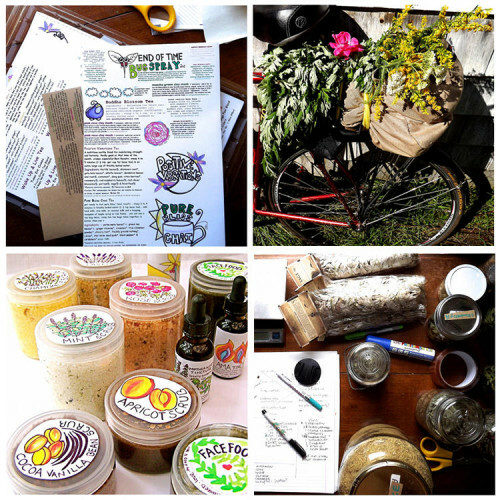 it is all natural and locally sourced and the products are handmade . they are some of the best type of products you will find I think . I love that the products used on Good 4 You are all natural, with no chemicals. I can purchase with confidence that my body is not ingesting toxins when I use Good 4 You’s products. The older I get, the more careful I am about what I put on my skin, and I love that Jes uses locally grown herbs–some she even picks herself right on Cape Cod!–in her products. I just love herbs and anything that is made with herbs and I think they are healthier than chemical based products, so I love all of Good 4 You Herbals products. Thanks for a great giveaway! Wow, the Facefood Mask looks wonderful. Also the Rose clay Mask looks great too. I bet the Rose petals would make a wonderful rose water. I will have to bookmark good4you for the future. Maybe a nice Christmas treat. The products look wholesome and great. I love that they have all natural products. The name says it all, good4you! I love that everything is handmade and all natural!